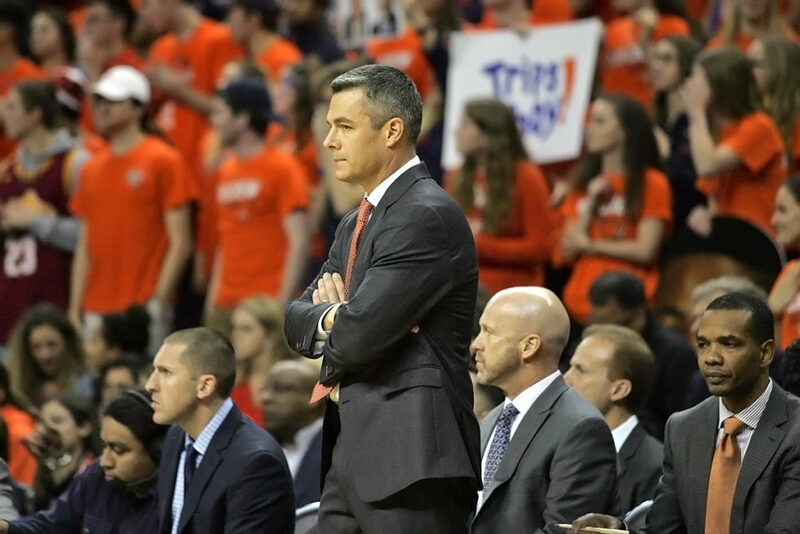 UVA head coach Tony Bennett and company won’t have to travel far to evaluate during next year’s NBPA Top 100 Camp. The Virginia men’s basketball coaching staff won’t be the only Division 1 coaches in Charlottesville for next year’s NBPA Top 100 Camp, thanks to a series of rule changes announced by the NCAA’s Board of Governors and Division 1 Board of Directors on Wednesday (August 8). These rule changes are in response to the recommendations issued this past April by the Commission on College Basketball, which was tasked with finding solutions to corruption related to college basketball and recruiting. The NBPA Top 100 Camp is traditionally one of the top events for high school prospects. The annual event, which assembles top prospects in various classes from throughout the country, has taken place in John Paul Jones Arena since 2007. Division 1 coaches, including head coach Tony Bennett and staff, had not been allowed to evaluate prospects at the event, but that will change next year. As part of new legislation, the following changes to the Division 1 men’s basketball recruiting calendar were announced on Wednesday. The changes take effect April 1, 2019. The calendar also allows coaches to attend NCAA youth development camps in late July, a new collaboration between the NCAA, USA Basketball, the NBA and the NBPA. The primary difference between the 2017-18 and the 2018-19 Division 1 men’s basketball recruiting calendars is the Evaluation Periods, a key time for college coaches to watch recruits compete in a live game setting. The AAU circuit, highlighted by Nike, Adidas, and Under Armour sponsored leagues, has been very important in this regard. In 2017-18 there were five Evaluation Periods – two in April and three in July – for “certified events only,” which included AAU. College coaches turned out in droves in April and July for Nike, Adidas, and Under Armour sponsored AAU play, and to a lesser extent events not sponsored by major shoe companies. -April 26-28 Evaluation Period: Certified nonscholastic events only. -June NBPA Top 100 Camp Evaluation Period: Two days of camp only (days to be determined). -June 21 (6 p.m.)-23 (4 p.m.) Evaluation Period: Scholastic events approved by NFHS only (see Bylaw 13.1.7.5.3). -June 28 (6 p.m.)-30 (4 p.m.) Evaluation Period: Scholastic events approved by NFHS only (see Bylaw 13.1.7.5.3). -July 11-14 Evaluation Period: Certified nonscholastic events only. -July 23-28 Evaluation Period: NCAA youth development camps only. Virginia’s coaches won’t have to travel far to evaluate at the Top 100. But how will the rest of recruiting changes impact the Cavalier staff as well as other Division 1 coaches? A major positive of AAU was that it allowed college coaches the opportunity to see a large pool of prospects in one space a handful of times every year. Moreover, those prospects were able to compete against the nation’s best. While we haven’t asked Bennett about these changes directly as of yet, I imagine these aspects of AAU competition were beneficial for pretty much every college coach in terms of evaluating a larger pool of prospects more easily and discovering new prospects. My initial thought is that this will not have a major impact when it comes to pure evaluations. From Virginia’s standpoint, Bennett is known for his meticulous nature in all aspects of his program. Two Evaluation Periods for AAU events should be plenty. I do have a few questions, though. – With the emphasis now more on high schools and the NCAA/NBA to produce events for coaches to evaluate, will they be ready to hit the ground running? After all, these rules take effect in 2019. – How will the “scholastic events” in June and the youth development camps look? Will they give exposure to a large amount of prospects? – Could these changes hurt the late bloomers? Highly rated recruits won’t be impacted, but how about those players who have gotten noticed later in AAU play? Might some of these players not have as much opportunity to get noticed? Other recruiting related changes announced, including official visits. Five visits between Aug. 1 and the end of their junior year of high school. Five visits between the end of their junior year and Oct. 15 after high school graduation. Five visits between Oct. 15 after high school graduation and the remainder of their college eligibility. A student-athlete can visit a school only once per year. Unofficial visits — those made at his or her own expense — cannot begin before Aug. 1 of the student’s sophomore year of high school. Schools now can pay for 28 official visits for recruits (34 for national service academies) over a rolling, two-year period. I don’t expect prospects to make the 10 official visits they could possibly make from August 1 of their junior year to when they graduate college. I can see high school juniors taking advantage of the opportunity to take officials earlier, though. With Virginia, it will be interesting to see if the Hoos push for some class of 2020 kids to make officials (paging Keon Johnson and Henry Coleman III?). The Hoos currently have four scholarships available in the class, so it would be nice to get started. Those who break the rules face stronger penalties, including longer postseason bans (up to five years), longer head coach suspensions (could extend beyond one season), longer employment limitations for coaches and staff who violate rules (potential for lifetime show-cause orders), increased recruiting restrictions and the loss of all revenue associated with the Division I NCAA Men’s Basketball Championship. These stronger penalties are effective immediately. The NCAA also adopted rule changes when it comes to the NBA Draft. One concerns players who declare but aren’t drafted. College basketball players who request an Undergraduate Advisory Committee evaluation, participate in the NBA combine and aren’t drafted can return to school as long as they notify their athletics director of their intent by 5 p.m. the Monday after the draft. This change is effective if/when the NBA and NBPA make an expected rule change, which would make undrafted student-athletes who return to college after the draft ineligible for the NBA until the end of the next college basketball season. If the above rule eventually is implemented, it causes a dilemma. Would you keep a spot or two open just in case, or do you try and fill all of the scholarships? Another rule, which is effective immediately, gives those players who have declared more information on whether or not to stay in. Since 2016, college athletes who are interested in going pro have been able to declare for the draft and attend the NBA combine but have been required to withdraw no more than 10 days after the combine to stay eligible. Now, students who wish to enter the draft also must request an evaluation from the NBA Undergraduate Advisory Committee, which will provide valuable information to assist student-athletes in making the decision to turn pro or stay in school. Additionally, if a player leaves school after two years and wants to return to complete their degree within 10 years, the school will be required to pay tuition, fees, and books. Division I schools will be required to pay for tuition, fees and books for basketball players who leave school and return later to the same school to earn their degree. Former student-athletes will be eligible for financial assistance to complete their first degree if they were on scholarship and fewer than 10 years have passed since they left school. Additionally, students must have been in school for two years before leaving. Former student-athletes also must meet all the school’s admissions and financial aid requirements and must have exhausted all other funding options to be eligible, as well as meet all NCAA academic requirements. To read all of the new NCAA rule changes, click here.